All physical therapy evaluations and treatment plans are performed by an experienced and licensed therapist (not an assistant or aide), with one-on-one care for 40-60 minutes. Please note that our priority is to provide attentive, one-on-one, hands-on care to maximize and speed your recovery. No Florida doctor prescription is necessary for the first 30 days of treatment (except for Medicare and other Insurance-billed treatments). We will help you reduce your pain, discomfort, swelling or dizziness; and help you resume your strength, flexibility, stamina, balance, walking and confidence with your daily activities. 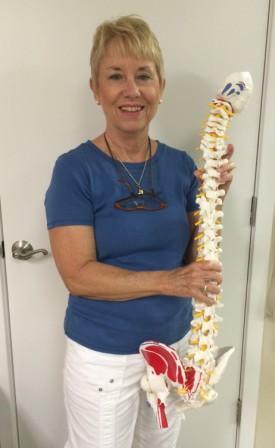 We pride ourselves in our effective and skilled hands-on manual therapy, neuro-muscular techniques and customized therapy programs to achieve your goals. Modalities such as medical ultrasound, neuromuscular electrical stimulation, paraffin wax, traction, Graston tools, kinesiotaping, moist heat and cold packs may also be utilized. Exercise equipment including weights, parallel bars, Pilates reformer, BOSU, balls, stability chair, bands, spring resistance, varied table heights are incorporated into treatments. A private room is also available. We do NOT believe in the "no pain, no gain" mantra, and will individualize and customize our therapy to maximize your goals for recovery in the shortest possible time, with a thorough and evidence-based approach. Additional Island Therapy Center services including massage therapy (by licensed massage therapists) Trager Approach and Pilates individual sessions (by Pilates certified instructor) may be an adjunct to your program. 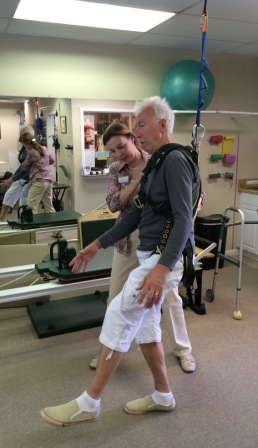 A ceiling-mounted track system with comfortable harness (rated to 350lb), is utilized by the physical therapists for safe and effective balance and gait training. We are participating providers with Medicare Part B, and Medicare Supplemental Insurance plans. This means that we will not bill Medicare patients higher than the Medicare allowable rate, and we will submit claims for you directly without requiring payment at time of service. Some supplemental or secondary plans cover the Medicare deductible and 20% balance not covered by Medicare. Others will require a co-payment or portion of the balance to be paid by the patient. Please check your policy for details, as we may be out-of-network with your secondary payor. If you are receiving Medicare Part A or Home Health Agency services (including nursing/IV services), or you wish to receive Maintenance Therapy services, we will be unable to bill Medicare Part B. Self-Pay options would be available for these situations. Some of these plans may have lower premiums than traditional Medicare Part B, but please be aware they often carry higher co-pays for therapy services. We are in network with many Medicare plans, however we (and other local therapy providers) may be out of network with the primary carrier, which may result in a higher co-payment. Please note that any co-payments will be due at the time of service. We are happy to file your insurance for you, or provide you with the appropriate forms to submit yourself. We additionally offer a generous flat-rate, prompt-payment discount for payment at the time of service to all our non-Medicare patients. We are required by law to collect any patient responsibility amount (co-insurance, co-payment, deductible) determined by your insurance, up to the discounted rate. The patient responsibility portion of your charges is based on our submitted rates (if we file your insurance for you), not the discounted rate. Rest assured that any reimbursement for claims we file on your behalf will be sent directly to you, or reimbursed by us within 30 days, once all insurance payments received. While we are approved providers for all major insurances, we are not in network with insurance carriers who have closed networks in the area, or who offer rates below the Medicare allowable. Please be sure to ask any other physical therapy providers you may contact whether they are "in-network" with your insurance in order to compare rates, and whether these providers guarantee one-on-one care. Patients choose our therapy services because of our quality of care, the one-on-one 40-60 minute sessions with our skilled physical therapists (not assistants or aides), and our ability to achieve your goals in fewer visits with lasting results. We will collect payment towards your deductible at the time of service. Our discounted rate is comparable to Medicare allowable rates. Please note that while we will call to verify your benefits, we are often quoted incorrect information and can only relay what we are told by your insurance company. Initial verification of benefits is NOT a guarantee of payment, and you will be required to pay any deductible or co-insurances instructed by your insurance company. For prompt payment at time of service, we will not balance-bill you above the insurance allowable rate. Covered benefits from auto insurance after an accident vary greatly, from full coverage to a limited number of visits for physical therapy and/or massage therapy. If you have been in an accident and have a physician's referral for physical therapy and/or massage therapy, we will be happy to process your insurance claims. Please be aware that payment for services is due at the time of service (flat-rate self-pay rates, see below), even if your insurance adjustor states that your therapy sessions will be paid in full. We always reimburse any payments from your insurance company within 30 days, and will send your insurance adjustor/attorney all required documentation. We offer a generous flat-rate prompt-payment discount on our rates for individuals who pay at the time of service in our clinic (comparable to Medicare rates). This option is advisable for those with high deductibles or HMOs. We are also happy to provide the appropriate paperwork our international patients, or those who choose to file their own insurance. Full price is required for home visits. In Florida, a physician prescription is not required for the first 30 days of treatment. For Medicare patients desiring continued sessions once therapy goals have been met to maintain their level of function and mobility, maintenance therapy sessions are available. These sessions are formally conducted and supervised by your physical therapist and are offered at an additional discount off our self-pay rates. Most insurance, including Medicare, do not pay for services once a maintenance level has been reached. An Advanced Beneficiary Notice (ABN) form will be provided. Please see our staff and associates page for therapist biographies.